Looking for the most professional and experienced team of Bahamas fishing captains with which to explore the populous and diverse reefs of the Bahamas? Then let Captain Carl Blades and his talented and passionate team of fishing tour guides lead the way! With Captain Carl and his Bahama Reef Fishing tour, you will get the chance to explore the Bahamas coral reef ecosystems on comfortable 27-foot Blue Sea Hunt. On board this small but luxurious center console boat, you will head out just a few miles off the shore to begin a reef fishing trip like no other! This smaller vessel is ideal for fishing at the reefs, using the best light tackle fishing gear to make sure you experience the most successful and memorable fishing trip possible. Captain Blades and his team have decades of experience fishing in the Bahamas, so you can be comfortable that you are in the right hands. Your captain will take you out to the best spots for reef fishing based on the day’s conditions such as wind direction. All fishing gear is included in this trip. And the best part is that these fishing trips are fully customizable. If you are looking ot also go snorkeling, for instance, we will be happy to bring along our snorkeling gear. If you want to experience a remote Bahamas white-sand beach, we will make that happen! 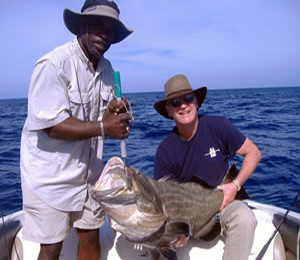 Captain Carl Blades has a reputation for providing some of the best private charter excursions in Nassau and even with the fishing-focused excursions, he will be sure to do everything he can to provide the private charter trip that you dream of! In fact, if you add the beach stop, your captain can even cook up your fresh catch for you! Here at Fish In the Bahamas, we aim to treat you like royalty during your vacation in the Bahamas. We also aim to showcase the amazing fishing in the Bahamas by providing you with only the most dedicated and experienced captains available. A lot of these fishing charters do tend to fill up weeks in advance, so we always encourage our guests to get their reservations in as early as possible! I have been to the Bahamas many times, but Bahama Blue Reef Fishing - 27' Sea Hunt is one of my favorite trips! It includes everything that everyone should do here. As a Bahamas veteran, I can say only the best about this experience!